So far in 2017, increased hydroelectric generation and solar power generation in California have contributed to lower natural gas-fired power generation in the California Independent System Operator (CAISO) region, the electric system operator for much of the state. In a late April update to several state agencies responsible for planning and managing California’s energy reliability, Southern California Gas Company (SoCalGas) outlined its views regarding several assumptions and challenges for safely and reliably serving its customers in Southern California over the coming summer and winter. SoCalGas cited expectations of warmer-than-normal summer temperatures driving increased electricity demand as one of the factors raising potential energy reliability concerns. The ability to draw natural gas from storage fields in the SoCalGas system continues to be affected by operating restrictions on SoCalGas’s Aliso Canyon field, an underground natural gas storage facility with a capacity of 86 billion cubic feet (Bcf), or 64% of SoCalGas’s total storage capacity. This facility is still recovering from the leak that was initially detected in late October 2015 and plugged in February 2016. 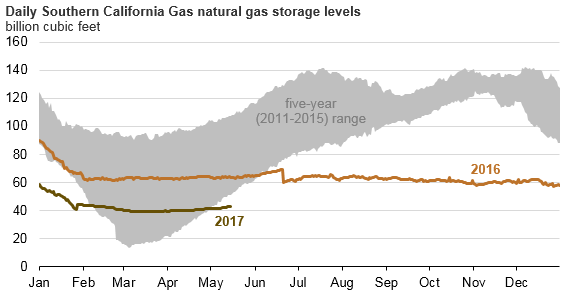 Following the leak, Aliso Canyon natural gas storage levels were reduced to about 15 Bcf, and total combined inventories at all of SoCalGas’s storage facilities remained about 60 Bcf throughout most of 2016. In June 2016, the California Public Utility Commission (CPUC) conditionally authorized SoCalGas to withdraw the remaining 15 Bcf at Aliso Canyon. Storage injections into that field would require additional regulatory approval. A total of 19 Bcf was withdrawn from the SoCalGas system from November 2016 through the end of March 2017, including withdrawals from Aliso Canyon during a two-day cold snap in late January. Over the five prior November-through-March periods, withdrawals averaged nearly 60 Bcf, ranging from 31 Bcf to 103 Bcf. As of May 16, SoCalGas’s inventory stands at 43 Bcf. The availability of natural gas in Southern California has implications for regional power generation. For most days so far in 2017, the share of CAISO’s electric power generated from natural gas has been near or below previous five-year (2012–16) minimums. The share of electricity generated from natural gas in CAISO typically reaches a low point in the spring, when temperatures are relatively mild, hydroelectric output is high, and electricity demand is relatively low. However, unseasonably warm weather in early May contributed to an 80% increase in natural gas use for power generation compared with daily averages in April. Warmer weather this summer will likely result in increased use of natural gas. The National Oceanic and Atmospheric Agency’s (NOAA) forecast issued at the end of April expects a warmer-than-normal summer for California. During summer months, demand for electricity—driven by air-conditioning use—is typically at its highest. 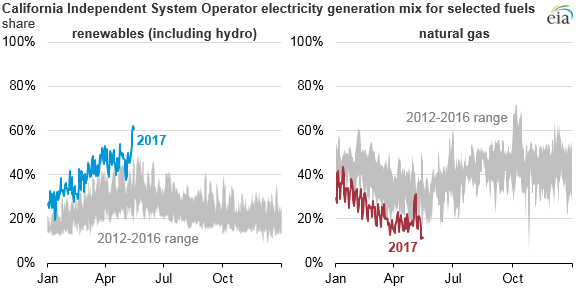 Increased hydroelectric output in the CAISO electricity market, along with continued increases from grid-connected solar power generators, has offset lower natural gas generation so far in 2017. Through May 8, California has averaged 38 inches of snow-water equivalent since the first of the year, about double the precipitation through that point in 2016. In the first four months of 2017, average daily solar output has increased by 27% over the same time period for 2016, according to EnergyGPS data. California energy market stakeholders—including the CAISO, the CEC, the Los Angeles Department of Water and Power, and the CPUC—will hold a Joint Agency Workshop on Energy Reliability in Southern California on May 22 to discuss summer energy reliability in Southern California. EIA publishes the Southern California Daily Energy Report to provide daily statistics on regional temperatures, electric power loads, natural gas flows, SoCalGas send-out, changes in SoCalGas inventories, and spot natural gas and electric power prices.